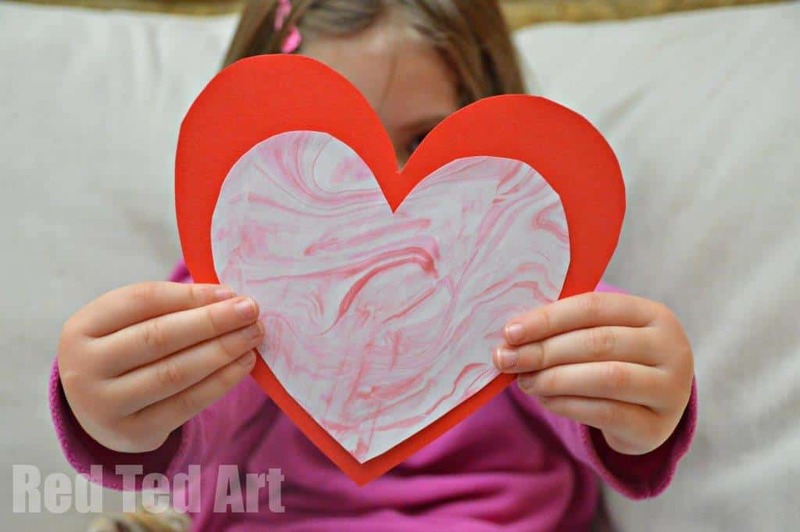 Get Messy Making Valentines + The Benefits of Messy Play For Pre-schoolers. The idea for today’s post comes from the wonderful website Red Ted Art. This site is a treasure trove of art and craft projects with videos for kids of all ages. Materials: trays, shaving foam, red and pink non-toxic acrylic paint, craft sticks, hearts cut from white copy paper. 1. Squirt shaving foam into a deep tray and drizzle red and pink paint over the top of it. 2.Take Popsicle sticks and gently swirl the mixture around until the paint leaves a trail behind it through the shaving foam. 3. Press large paper hearts down into the mixture leaving them to completely dry. Whether you love to get messy or not, there is no doubt that the benefits of letting your kids enjoy messy play at home, definitely outweigh the post-session clean up operation. With careful planning and preparation, there is no reason to stress the mess of setting up a messy play activity for your child. Instead sit back and enjoy watching them learning as they play. Exploring different materials and textures with their hands provides an excellent work out for their developing fine motor skills. Allowing your child to take charge of how they use the activity is great for their confidence and self-esteem. It can be used to stimulate all of their senses or just a few at a time. Listening too and talking to your child about what they are doing, works not only on building their language skills, but it is also helping to expand their growing creativity and imagination. It may look like a pile of mush to you, but listen to how your child’s imagination can bring it to life.